This dish was inspired on a recent lunch trip. This quiche was the quiche of the day. I didn't order it, even though I was tempted. I ordered the chicken sandwich (shocking, I know). I did make a note to recreate the quiche for dinner the following week. The quiche turned out SOOO delicious! It had all the flavors of a loaded baked potato. I used frozen diced potatoes, bacon, cheese, sour cream and green onions. This came together quickly. You can make this the night before you want to bake it and store it in the refrigerator until you are ready to bake it. I actually made two quiches and froze one for later. Place potatoes and bacon in bottom of pie crust. Top with cheese. Whisk together eggs, milk, and sour cream. Pour over bacon and cheese. Top with green onions. Bake for 40-50 minutes, until center is set and the quiche is lightly browned. Allow to cool for at least 5 minutes before serving. Sounds wonderful, Steph! Is the chopped bacon pre-cooked? Thanks so much. This sounds great! I wonder if you added Ranch dressing if it would be like the "crack" recipes? Sounds delicious. Pre-cook the bacon? b & LLZKCj - yes, precook the bacon. I'll update the directions. Thanks! 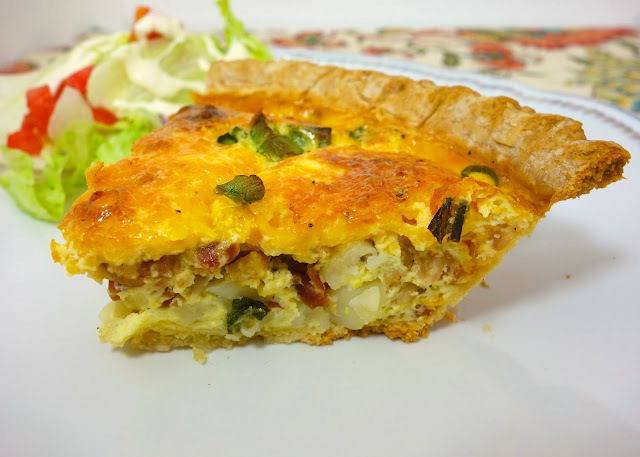 Shell - I do have a Cracked Out Quiche recipe on the blog - it is delicious! I ALSO LIKE YOUR "BUNNY/CHICKEN"
YUMMY! Definitely trying this out! This sounds really good Steph. Made this tonight. Great flavor but my potatoes were still hard. I couldn't find freezer diced potatoes, so I got a bag of refrigerated. After being in the oven an hour, they were still hard and my crust was about to burn. But otherwise this was good, had a spring mix salad with it and strawberries. I'm pinning this--looks delish. Tonight I made your Chicken Popper Wraps--I turned them into quesadillas, they were just excellent! Thanks for sharing fun recipes. Sounds yummy! Can you use regular baking potatoes and dice them up yourself? Lauren - I don't see why that wouldn't work. Let us know how it turns out. 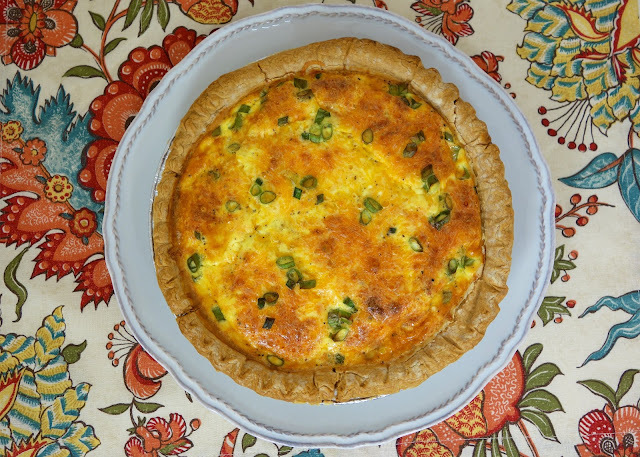 How did you freeze the extra quiche? Did you freeze it before you baked it or after and did you wrap it up or seal it in some particular way? How do you recommend defrosting it? I've never frozen quiche before. Thanks! Jessica - I freeze the quiche before baking. I wrap it is plastic wrap and then with foil. I let it defrost in the fridge before baking. You can bake it frozen - cover it with foil and bake about 15 minutes, remove the foil and continue to bake about 30-40 minutes. 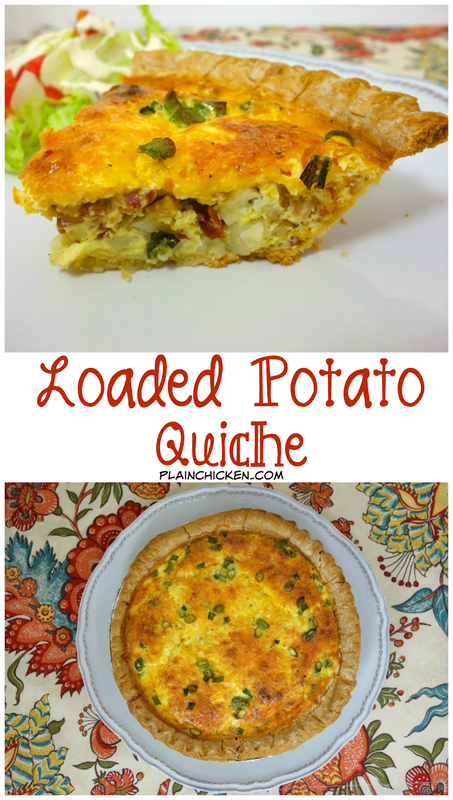 love this quiche. i cook two small potatoes in the micro and cube them. works great. also, i add garlic powder in with the eggs, since we love garlic. and i have used ham instead of bacon before when time was short and it was also delish.